Prepare your home for the cold winter season by calling us your reliable plumbing company, to request services that will winterize your home. We use heat tape on pipes to prevent frozen pipes and other problems that can occur with the harsh cold weather that brings us during the winter. Winter freezes won’t leave you with frozen pipes when you call us, your expert plumbing company, to winterize your home! Our plumbers are experts at utilizing heat tape, heat wires, and making sure your water pipes are safe from the cold weather. We also offer plumbing repairs, plumbing maintenance and drain cleaning to ensure your home’s plumbing system is ready for the onslaught of winter. For all your plumbing needs – in winter, spring, summer and fall – all season long, you can count on us to be your reliable plumbing company. We are known as the clean and on time plumber dedicated to providing top quality, reliable plumbing services to homeowners. 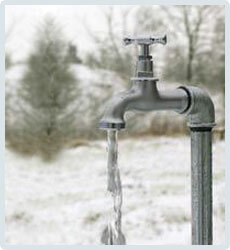 Give us a call today to learn more about our the winter preparations we can make for your plumbing system.